When Hammersmith & Fulham Council told the Irish Cultural Centre back in 2010 that it planned to sell the building that housed it, it seemed that after 20 years West London’s Irish community was about to lose its creative hub — particularly since the Council wanted £1.5 million for the purchase of the building. But according to Acting General Manager, Katie Walsh, following a great deal of hard work, the Irish Cultural Centre secured the freehold and rebuilt the new Cultural Centre (HICC). Over £3.5 million was raised and invested to rebuild this Centre, with support from the Irish Government. The ICC formed a partnership with Shepherds Bush Housing Association, the old Centre was knocked down and a new one built, above which are social housing flats. The project has been greatly beneficial to the local community. “Then in August this year we received a grant of £191,000 from Hammersmith and Fulham Council to assist with the fit-out of the Centre to allow us to be fully operational,” she stated. The technical fit-out was entrusted to Gerry Logue, an experienced touring audio engineer, who had mixed bands at the old Centre. London based for over 20 years Logue progressed onto high profile projects including The Millennium Dome, Wembley Stadium, The Commonwealth Games Manchester, Croke Park Stadium Dublin and Friends Arena Stockholm. Together with Duncan Wood from LCG Productions they were commissioned to design and install the technical production systems for the new HICC. As a result of previous successful projects with HARMAN Pro’s UK distributor Sound Technology Ltd, Logue was soon specifying JBL’s new CBT1000 column array PA for the new multifunctional, 250-capacity space. The latest - and largest - model in JBL’s popular Constant Beamwidth Technology column array series, the CBT1000 formed part of an all Harman integration which also includes Crown amplification and Soundcraft mixing console. But alluring as the prospect of retrofitting a top grade PA was, LCG Productions realised that despite the limited time they had to provide the technical infrastructure, they first needed to apply acoustic treatment to the structure to mitigate the long reverberation time. At the same time, mindful that this multifunctional space would need to accommodate everything from tea dances to world class traditional Irish folk acts, with hard to reproduce virtuoso Uillean pipes, bouzoukis, concertinas and fiddles — as well as local Irish community functions — they knew that a complete acoustically ‘dead’ environment, devoid of any reflections, would do no favours to the live characteristic of acoustic and unamplified instruments. Logue takes up the story. “The old place had horrible acoustics and I knew we needed an environment and systems that would facilitate music, performance, presentation and conference events, and at the same time would provide flexibility to be run day-to-day without a skilled operator. “I contacted Ben Todd at Sound Technology’s Application Team and we came up with a plan for the best solution,” he continued. “Ben gave us some options and the CBT1000 seemed the obvious solution since it was both steerable and controllable. I went to Sound Technology’s demo facility and auditioned the CBTs and knew immediately it was the right box.” This offers adjustable direction, with asymmetrical vertical coverage and tapered horizontal coverage. 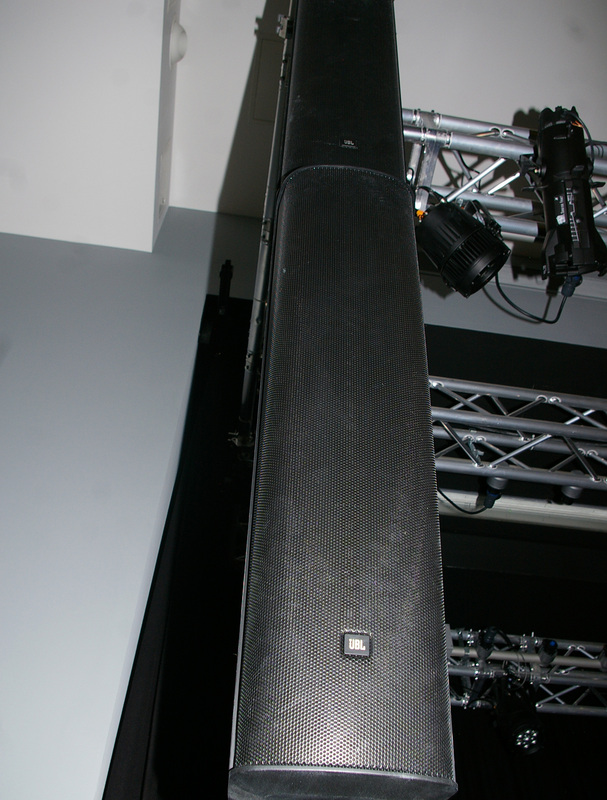 A single CBT1000 column has been flown below CBT 1000E Extenders on either side of the stage to achieve the HF coverage in the front row. To achieve the optimum array angle, Todd assisted with EASE and laser predictions. The system is driven by a Crown DriveCore DCI 2/2400N (2 x 2400W/4 ohms) amplifier while a Crown XLi1500 runs the two JBL Control 28-1 delay speakers, covering the mezzanine. Meanwhile, six JBL PRX 812W wedge monitors are already receiving high usage by the visiting traditional Irish artists. Outside the main hall, the foyer/reception area is covered with a further pair of JBL Control 28-1, together with an SB2 subwoofer powered and processed with a JBL Commercial Series CSA 1300 Z amp and CSMA 2120 mixer amp; sources include a paging mic, wired PC input and a wifi streaming router. 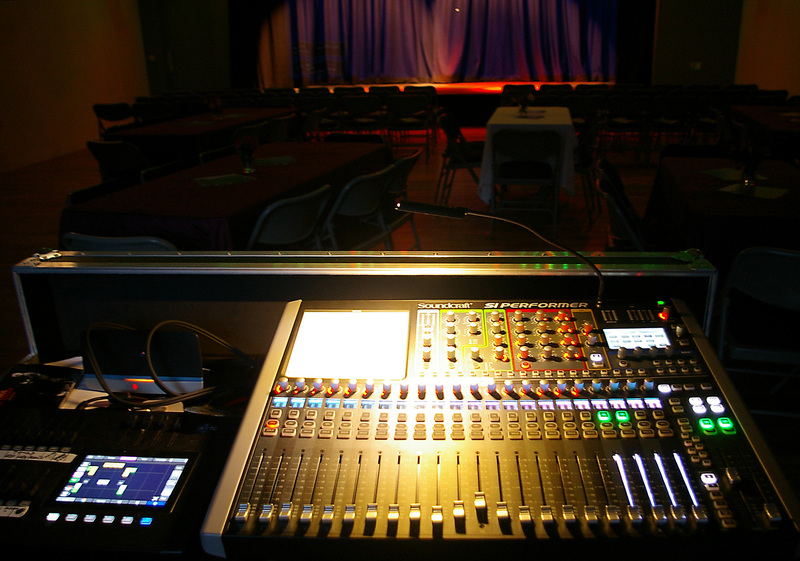 At the same time Gerry Logue specified a Soundcraft Si Performer 2 digital mixer, knowing engineers’ familiarity with the Soundcraft topology.” The 32-channel desk he sensed would provide flexibility and allow system presets to be locked in, while being easy for any visiting sound engineer to jump aboard. 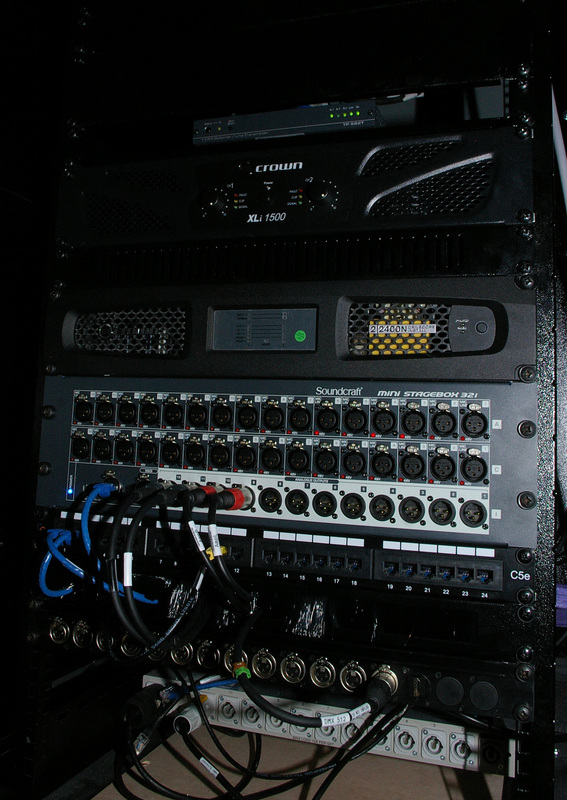 Desk inputs include a radio mic, with playback via PC inputs on stage and in the control room. There is a CD player for background music as well as video projection and lighting scene presets locked into the lighting desk. Inspecting the installation it is easy to see the attention to detail with regard to tidy cable management, sophisticated rigging and bespoke flying frames for the CBT’s, masterminded by Wood. LCG have provided four motorised chain hoists for the trussing rig, stage drapes and track together with drapes on the rear wall and a pipe and drape system on the mezzanine floor, all of which help to reduce the RT time — as well as acoustic wall treatment in the form of Quattro Board and Hushboard™ Sound Deadening Board. And aided by the steerability of the CBT1000 they have been able to kill the slapback from the mezzanine. The installers also provided comprehensive stage lighting and video projection systems as part of a turnkey project. Recalling the frantic installation process, Logue recounts, “We completed five and a half weeks’ work in two weeks. We had a deadline of September 30th for the concert by Irish folk legends Dervish and to say it was intense is an understatement. We changed from a building site to a venue in the final two days. And the final word comes from Gerry Logue himself. “To work with traditional music you have to understand the music and the dynamic, and be sympathetic towards it. The clarity, coverage, control and coherency of the JBLs are all exceptional, and we are very happy with the Soundcraft Performer. Expanding upon our highly successful Constant Beamwidth Technology™ breakthrough, the CBT1000 represents the next-generation in pattern control consistency utilising adjustable vertical coverage and a tapered horizontal waveguide to increase the versatility of aiming the coverage of the loudspeaker to more accurately map to the room geometry in a wide variety of listening spaces. Low frequency extension cabinet for the CBT1000. Six 6.5" high-excursion LF drivers extend the bass response of the system to 38Hz. Pan/tilt bracket and coupler plate included.